DIXIELAND JAZZ COMBINED WITH COUNTRY? 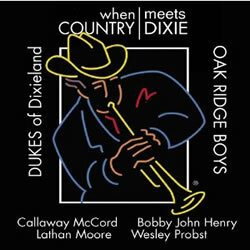 Why not, said the Oak Ridge Boys and the Dukes of Dixieland, who combined two American art forms to create a new genre with the just-released When Country Meets Dixie. They recorded four tracks together, including a unique “N’awlins”-flavored remake of the Oaks’ platinum-selling hit single “Elvira” and a Dixie-style version of “Little Talk with Jesus.” Rounding out the project are soulful performances by Callaway McCord, Lathan Moore, Wesley Probst, Bobby John Henry and Scott Obenschain.